My first introduction to this Jewish holiday was in 1990 when I moved to Los Angeles. I remember walking to school with one of my schoolmates and she telling me about the various type of food that were consumed in various Jewish holidays. I found it all fascinated right away because this new found knowledge was nothing that I had been exposed to before. I personally was fascinated culture wise, but also from a cuisine point of view, I guess I have always been a foodie at heart. But all that info happened 20 years ago and much off the details escape me today, therefore, I needed a refresher! Last week I emailed a friend, Mrs. Esther, to get a bit more info about the way Iranian Jews celebrate this holiday and what type of dishes they consume. Mrs. Esther shared a list of items with me which got the ball rolling for me. Then I walked over to our bookshelf and picked up our Jewish Cooking cookbook. Rosh Hashanah, which means “head of the year,” is the Jewish New Year which generally takes place either in the month of September or October. This day marks the beginning of Ten Days of Penitence, also known as Days of Awe. This ten days end with the celebration of Yom Kippur. During this ten day period Jews practice retrospection by engaging in repentance, prayer, and charity. 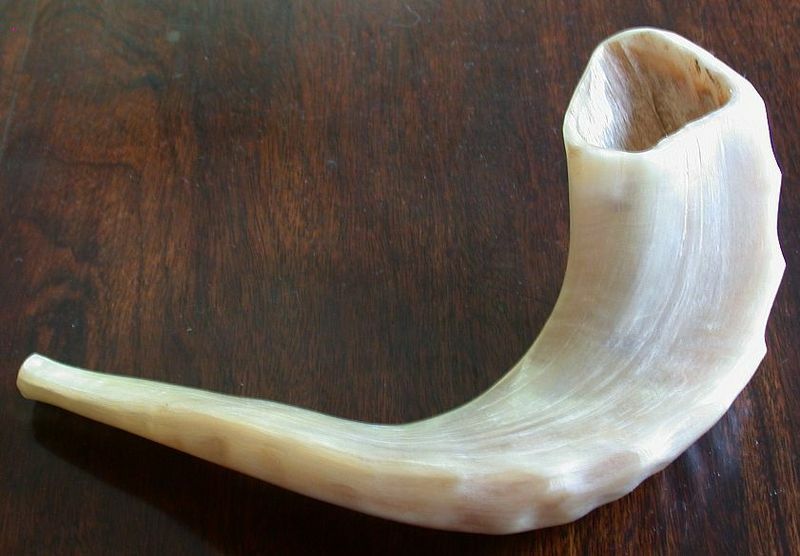 Rosh Hashanah begins at sundown and to mark the beginning of the holiday a ceremonial shofar, ram’s horn, is blown. Rosh Hashanah and Yom Kippur are referred to as the High Holy Days which are observed by all Jews, even the ones that don’t observe the rest of the holidays or festivities throughout the year. One of the traditions that is also observed during this time of the year is Tashlicht which is done by releasing all of one’s sins committed during the previous year in a running body of water. This action represents purification and symbolizes a new start for the new year. The foods that are consumed for the occasion are generally on the sweet side which symbolizes the sweetness of the festival. The fruits consumed are those in season and each food item symbolizes something different. I was able to find the symbolism behind some of these foods: Apple dipped in honey symbolizes sweetness for the year ahead. 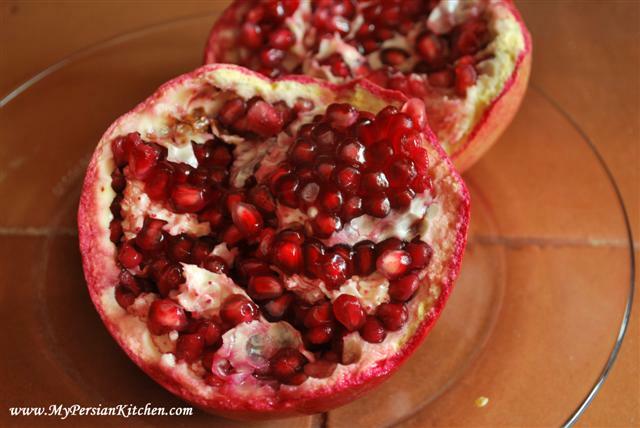 Pomegranate seeds represent fertility and tongue represents an edible portion of the head of an animal, which is consumed to represent the head of the year. 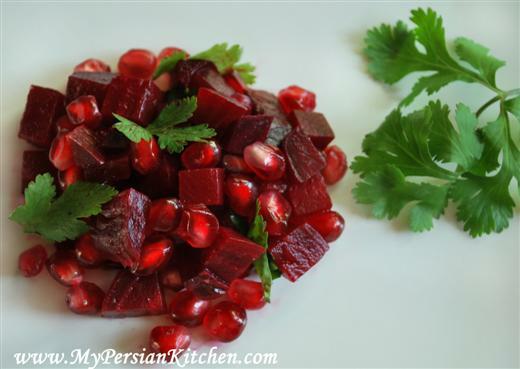 Remember the Beet and Pomegranate Salad recipe that I posted last year? It was a huge success last year when I posted it, and it’s featured again this year in the LA Times as one of the recipe options for the Rosh Hashana feast! So tell me, what Persian dishes are you going to eat tonight and for the rest of the holidays? I would love to know! Wishing you all shana tova umetukah (a good and sweet year)! Surely Honey Cake. Do you have something similar in Persian cuisine? Thank you dearest, for your article and wishes. While I keep a more traditional cooking for R”H (btw sepharadim jews eat head of lamb similar to kaleh patcheh and ashkenazim eat head of the fish as symbol to be ahead and not at the tail, never heard of eating tongue but it might be some families tradition). This is the best period for anar ablambu or sprinkled with salt and golpar, and tiny limes similar to limu shirazi dipped in salt! I was thinking about you after cooking a recipe from your site that you were kind enough to help me with the spices. Do you remember? Well, it has been a long time I know but I am very glad that you have come a long way with you cooking skills. Congratulations and keep the good cooking. Mely! yes, of course I remember! It was one of the first few recipes that I had posted! I actually so happened to check your website earlier today and low and behold you had a couple of new recipes. Your Salsa verde with avocados is a winner ever time I make it!! Yes, the beet pomegranate salad is perfect for Rosh Hashanah. Some eat beets on Rosh Hashanah and some eat the beet greens (swisschard), but either way they have the same name. by the way, what is Tareh?